Our entry level, high quality indoor cycle with many of the same proven Spinner® ergonomics and function as our other Spinner® bikes. The Spinner® Ride is a great option for facilities just entering the market, offering 10 or fewer classes a week, and looking to easily satisfy members with a reliable "turn key" experience of product, education, and service. Available in both belt and chain drive. With aerodynamic styling and rounded tube shapes, all Spinner® bikes are designed to shed sweat and be easier to clean and maintain. All aluminum adjustment extrusions and covered rear stabilizers protect from rust in places where it's needed most. Chain drive for an authentic ride with a real world bicycle feel, perfect for the cycle purist. Unique Spinner® perimeter weighted flywheel that evens out the pedal stroke and makes for a smoother more powerful ride. Steel frame geometry that matches outdoor bikesgives a natural fit for a wide range of exercisers. 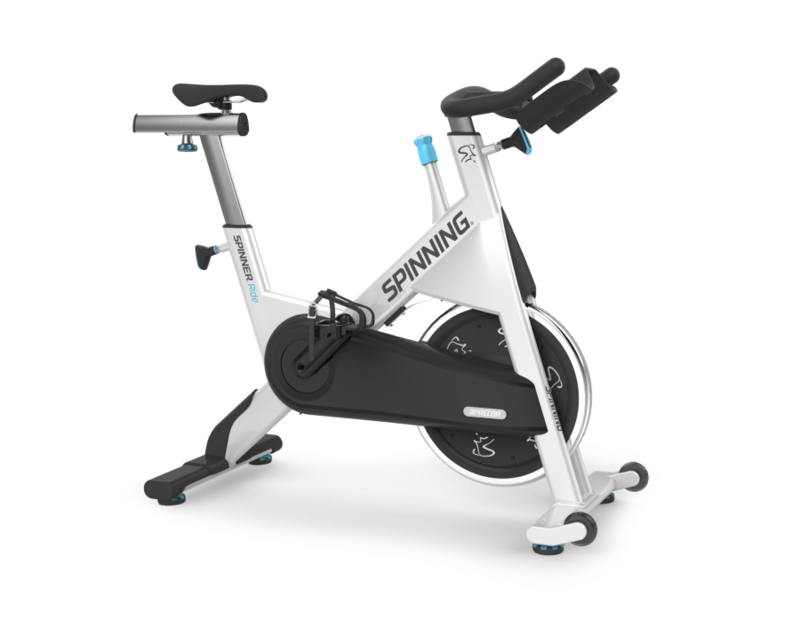 Designed to last in the commercial gym environment, the Spinner® Ride will out perform consumer market indoor cycles. Our mission at Precor is to develop personalized health and fitness experiences that help people live the lives they desire. For over three decades, we've driven fitness forward with a passionate focus on ergonomic motion, proven science, and superior engineering. We constantly study and anticipate the needs of the people and organizations we serve, and continually redefine the levels of innovation, quality, and service necessary to deliver the very best fitness experiences - all with the goal of improving the ways people improve themselves. Our equipment is chosen by health clubs, hotels and spas, universities, and individuals all over the world. "Fitness Made Personal" is a direct extension of the Precor Mission.It is a reminder of what we strive to be and how we are different than others in our industry. Fitness is our business. We strive to bring a personal touch to the experience of every exerciser, relate to operators in our industry in a personal way, and cultivate a culture that believes in mutual respect and the overwhelming returns of sharing. Precor is a proud member of Amer Sports, one of the leading sporting goods companies in the world. Its portfolio of internationally recognized brands includes Salomon, Wilson, Suunto, Atomic, Arc teryx and Mavic. All Amer Sports companies develop and manufacture technically advanced products and accessories that improve the performance of active participants in a wide range of sports, including tennis, badminton, golf, American football, soccer, baseball, basketball, skiing, snowboarding, fitness training, cycling, running, hiking, and diving. Amer Sports Corporation is listed on the Nasdaq OMX Helsinki. Established in 1980, Precor sets the standard for quality, innovation, and performance in exercise equipment. Precor has distinguished itself as a worldwide industry leader, providing state-of-the-art fitness equipment to health clubs, hotels, spas, fitness centers, and private homes all over the world. We began by launching the first ergonomically sound rowing machine in 1980, and we’ve been supporting the natural movement of the human body ever since. In 1990, we created the first cushioned treadmill. 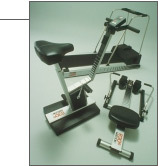 We introduced the world to the Elliptical Fitness Crosstrainer™ (EFX®) in 1995. Then in 2007, we released the revolutionary Adaptive Motion Trainer® (AMT®), a breakthrough piece of cardio equipment that constantly and fluidly adapts to your stride length and motion. Precor is founded by industrial designer David Smith as Precision Corporation. Precor develops the first ergonomically sound rowing machine, the Amerec 610 Precision Rowing Machine. 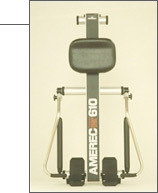 The Amerec 610 Rower is used by the U.S. Ski Team while training for the World Cup. The Amerec 612 Rower wins Award for Excellence from Industrial Design Society of Amerec; and wins first place in the durables category by The Aluminum Association Annual International Aluminum Extrusion Design Competition. Precor becomes the first fitness equipment manufacturer to add motivational microprocessor-based electronics to its equipment, providing continuous feedback and enhanced workout effectiveness. The Amerec 612 Rower is named Consumer Product of the Year by Industrial Design Magazine. The 935e Treadmill wins Excellence in Design award from The Aluminum Association, Inc.
Precor acquired by Dart and Kraft, Inc.
Precor introduces a full line of electronic ergometer treadmills, rowers and cycles. 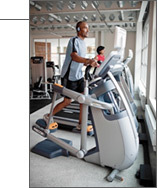 Precor Treadmill wins Best Category Award by Industrial Design magazine. Precor develops the first home and commercial programmable treadmills. Precor becomes a subsidiary of Premark International, Inc.
Precor creates the first cushioned treadmill, reducing stress on the body and joints during workouts. Precor forms a separate Commercial Products Division, and launches the 960 series commercial treadmills. Precor opens its first international office in the United Kingdom. Precor produces its one millionth piece of fitness equipment. Precor receives a patent for the unique Ground Effects (GFX) technology for its treadmills. Precor introduces the world to the first Elliptical Fitness Crosstrainer (EFX), creating a new category in fitness, with the EFX 544. Precor voted #1 supplier of treadmills by Sporting Goods Business. Precor acquires Pacific Fitness, reknown for its strength equipment. Precor wins Best Treadmill as judged by personal trainers. Premark merges with Illinois Tool Works (ITW), making Precor a subsidiary of ITW. Precor receives ACE Award for Excellence in Customer Satisfaction for treadmills. The 9.25i Low-Impact Treadmill wins Overall Excellence in Customer Satisfaction award from more than 20,000 treadmill owners polled by the American Council on Exercise (ACE). Precor earns Distinguished Business in the Green status, the highest recognition a company can receive from Green Works, a department of the King County, Washington, USA, Solid Waste Division. The Precor Recumbent Bike is winner of the 13th Annual Excellence in Design Award. The home EFX 5.17 and EFX 5.21si Elliptical Crosstrainers received Best Buy rating from a leading Consumer Rating Publication; and win Consumer Digest Best Buy certificates. Precor launches a multi-station home strength line featuring six models. The Washington State Department of Labor and Industries awards its first Ergonomics in Action award to Precor. Precor is purchased from ITW, becoming a subsidiary of Amer Sports Corporation, the world’s largest sports equipment company, with internationally recognized brands Wilson, Atomic, Suunto, Salomon, Arc’Teryx and Mavic. Precor expands into Japan, with new offices in Tokyo and Osaka. Precor acquires Fitness Products International (FPI) a manufacturer of single- and multi-station selectorized equipment, functional training/free motion models and two types of plate equipment including the Icarian brand, Abench, Flite®, Stretch Center™ and Jade® brands. Precor acquires entertainment technology leader, ClubCom, including its Cardio Theater division. Precor Cardio Theater named the industry's top entertainment supplier in the Nova7 People's Choice awards program sponsored by Fitness Management magazine. Precor doubles the size of its commercial strength equipment capacity by relocating its manufacturing operations to Valencia, California from Burbank. Cardio Theater named the industry's top entertainment supplier in the Nova7 People's Choice awards program. Global fitness industry leader Gold's Gym International Inc. names Precor as its Vendor of the Year for 2004-2005, and the Precor sales manager as the Outstanding Support Individual. For the third consecutive year, Precor Cardio Theater is named the industry's top entertainment supplier in the Nova7 People's Choice awards program. Precor and Hilton Hotels Corporation partner to launch Fitness by Precor facilities at full-service Hilton, Doubletree® and Embassy Suites Hotels® in North America, and at The Waldorf-Astoria in New York City. Anytime Fitness honors Precor with the 2006 Franchise Choice Award for Vendor Excellence. Precor launches the revolutionary Adaptive Motion Trainer® (AMT®), creating another new category of fitness equipment- adaptive motion. Precor wins Vendor of the Year award from Gold’s Gym International. S3.23 Functional Trainer for home use wins Best of Fitness Award from Health magazine. M9.35i home treadmill named one of top treadmills by Runner’s World magazine. Precor earns top awards in the annual Nova 7 People's Choice awards program, earning recognition as Best Cardio Equipment Supplier to the international fitness industry, and gaining Best Product of the Year recognition for the breakthrough Adaptive Motion Trainer™. The Adaptive Motion Trainer wins prestigious Red Dot design award as one of the world's best-designed products; and is honored as best product innovation at Fit2PRO, Belgium's national fitness-industry trade show. 2008 Precor again earns top honors in the Nova 7 People's Choice awards, named Best Cardio Equipment Supplier. Precor sells ClubCom to Zoom Media & Marketing. Precor introduces the all-new Experience Strength™ C-Line and S-Line machine-defined, selectorized strength equipment for fitness facilities. Precor announces intent to build a new commercial strength equipment manufacturing facility in Greensboro, North Carolina, USA, investing $26.2 million. The Hilton Family of Hotels announces that Fitness By Precor facilities have been installed in more than 500 Hilton Family hotels. The 9.31 home treadmill receives Top Treadmill rating from a leading Consumer Rating Publication, besting 28 competitors, in the February 2010 issue; and the S3.15 Strength System for the home awarded Best Buy from Consumer Digest magazine. Precor opens and begins operations at its new commercial strength manufacturing facility in Guilford County, North Carolina, near Greensboro. Operations move from Valencia, California, to Greensboro. The new Precor strength facility earns LEED CI Gold Certification by the U.S. Green Building Council (USGBC). Precor awarded Partner of the Year by 24 Hour Fitness. Precor awarded 2010 Vendor of the Year by Gold’s Gym. Precor is finalist in Washington’s Best Workplaces 2010 by Puget Sound Business Journal. Precor launches the new Experience Series line of cardio equipment, highlighted by the 880 Line with touchscreen console technology and network capability. Treadmill Doctor names 9.31 Treadmill its Best Buy Award Winner for 2011. EFX 5.31, 5.25 and 5.21 are named Best Buys in the Elliptical Category by Treadmill Doctor. The new AMT with Open Stride which allows the exerciser to change not only the length of their stride, but the height as well, creating an infinite range of motion paths. The new Discovery Line Plate-Loaded launches with seven re-designed stations. Preva Networked Fitness launches, bringing the best of internet content and personalization for engaging workouts for exercisers and management tools for operators. August: Gold’s Gym franchisees name Precor Vendor of the Year-Equipment for fifth time in eight years. Precor announced the acquisition of leading functional training systems provider Queenax into its range of offerings. 1. Precor redefined the cardio blue print with the new and improved Elliptical Fitness Crosstrainer™ (EFX®) with first ever Converging Cross Ramp®. 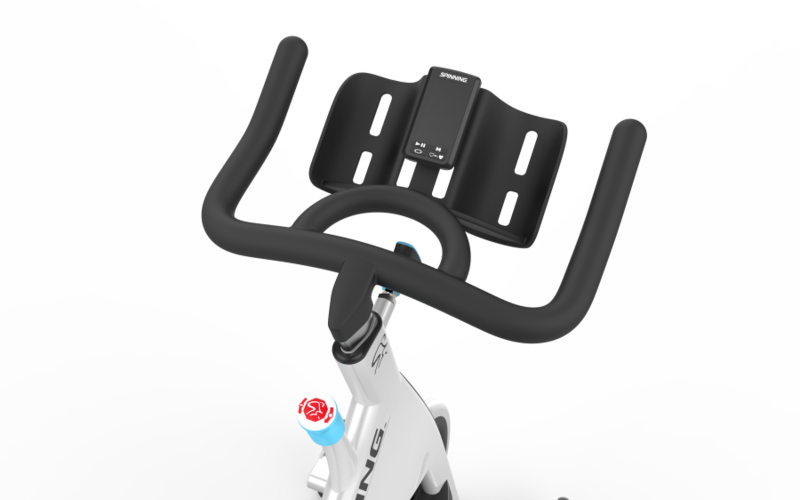 As part of this partnership, Precor manufactured an entirely new range of bikes and education resources were developed. Models include: the Spinner® Ride™, Spinner® Shift™, and Spinner® Rally™. Spinner® Chrono™ to be added in 2017.